August 1987. 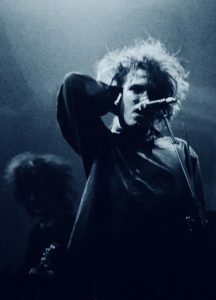 It was summer holiday when I read an announcement that The Cure would be visiting the Netherlands on their upcoming European tour. They would be performing two shows at the Rotterdam Ahoy’ Sportpaleis: on Wednesday 4th and Thursday 5th of November. The article said that in case of sufficient interest there would be an extra show on November 6th, which by the way didn’t happen. It was also the first mentioning and picture I saw of Roger O’Donnell, who had just joined the band.